atleast the black horse one looks like it belongs on the renegade. yours looks way too big and overpowers the look of the front. yours looks like the same one i had on my f150. We can agree to disagree there. Mine is a black horse and everyone compliments it, asked where I got it etc. There is one that Madness sells that wraps around the front that seems very popular but I think it's wimpy looking. So I guess It boiks down to personal taste. Sure, let me check it for you. 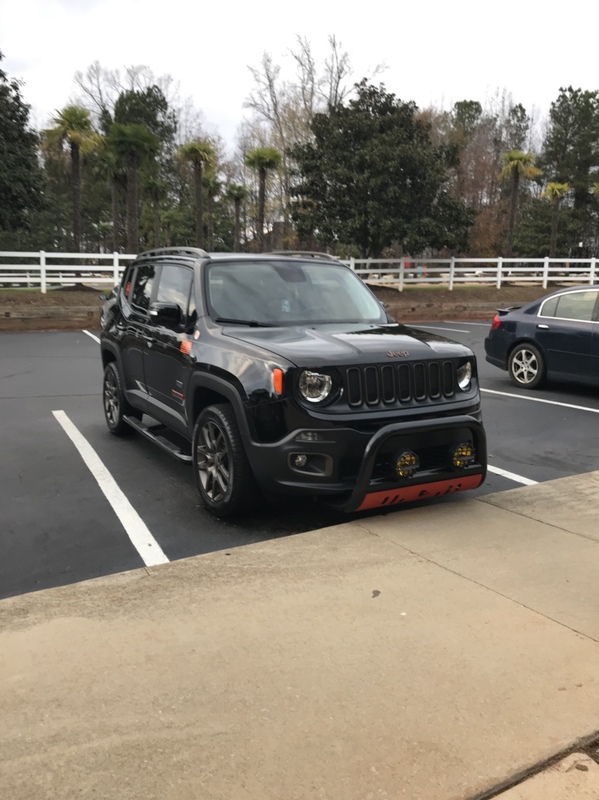 Is it a Sport, Lattitude or Trailhawk? would you please provide us with the installation instructions? as I've said before I bought the black horse model and the instructions are not clear at all and i can't seem to find instructions/pictures of the installation. pictures of the underneath of your front bumper will be appreciated. the same model that you have. Agreed the instructions are vague. I called Carid where I purchased them from and he e-mailed me instructions.. I'm at work so give me a bit and I'll look. That being said I just kinda winged it cause the instructions are terrible.There is no drilling, it's fairly obvious where the brackets go, then the bar attaches to the brackets. Make sure you put left to left and right to right or you'll be switching them. I unfortunately did that. I installed them completely by myself which was challenging, definately have a second pair of hands. Took me two hours. I think that one is ugly and small. I bought this one for $200 and installed it myself literally ( better with 2 people) took 3 hours. I think that thing looks super awesome and would look great on my Hypergreen Altitude. Everything is already blacked out so the extra black with red accents would look great in my opinion. I like the bigger bar, it adds some muscle to the Renegade. Which model is that one? 2018 Hypergreen Altitude! You can see my car from your house! Sorry haha, I meant which model bull bars do you have installed? I like them because they are bigger and beefier. I finally got to install it yesterday at a parking lot. It took me around 2 hours to install . Another pair of hand would have been better . but I did it without lifting the car . Easy installation , just get someone to help you.